Capacity 20kg in 24 hours. Ice dimensions 40 x 28mm. Ambient temperature range +15°C to +38°C. Supplied with scoop and installation kit. Electric 220-240V, 200W, 0.9A. H590 x W380 x D477mm. Customer service 7 days a week. 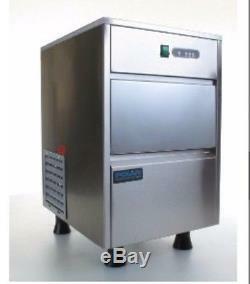 The Polar 20kg Commercial Ice Machine is a high quality reliable ice maker from leading brand Polar Refrigeration. Boasting a compact, easy-clean stainless steel design, the commercial ice machine is perfect for front of house ice dispensing in bars, pubs and other similar establishments. Featuring robust construction, it's designed to withstand rigorous commercial operation, whilst the user friendly control panel is simple to use and provides clear, concise feedback on the status of the machine. Supplied with installation kit and handy scoop. An optional external drain pump (AF309) is required if installing this unit lower than the drain standpipe, this is available below from our drop down options. The following terms of sale apply. Please pay for your item promptly. When your item is delivered, please check your item before accepting it. If your product is unwanted you can return it to us as long as you return the item unused, undamaged and in it's original packaging. The item "Polar T316 Under Counter Ice Cube Maker Machine Commercial 20kg/24hr Pub Bar Ice" is in sale since Friday, May 27, 2016. This item is in the category "Home, Furniture & DIY\Appliances\Small Kitchen Appliances\Ice Makers". The seller is "ecateringequipment" and is located in Wednesbury/ Birmingham . This item can be shipped to United Kingdom.